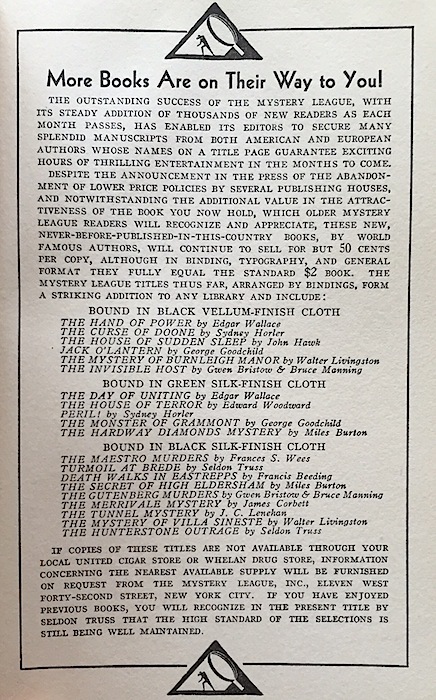 In 1930 the creators of The Mystery League decided to take advantage of the popularity of detective fiction craze and develop an inexpensive, easy to buy, line of crime fiction titles that would directly compete with the higher priced mainline hardcover publishers. 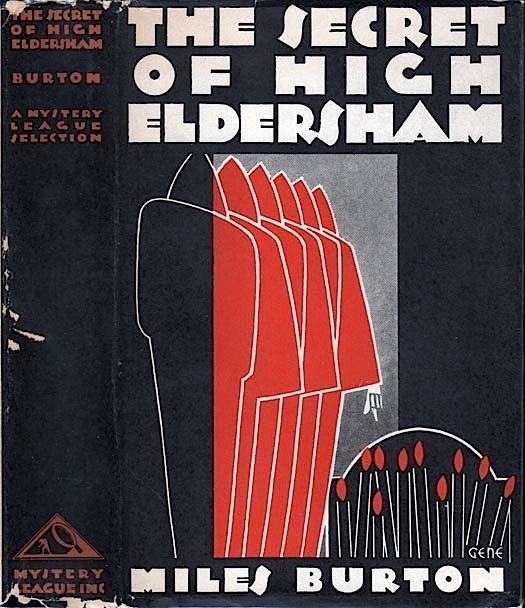 They spared no expense in the design of the books which were handsomely bound in three different bindings over its short five and half year life and got at least three different artists to design eye catching, Art Deco inspired, dust jackets which turned out to be their main draw to collectors as the years went by. 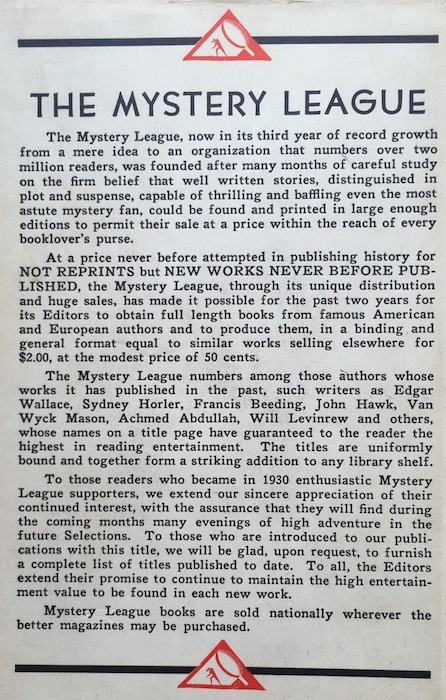 Initially, the books were priced at a mere quarter. 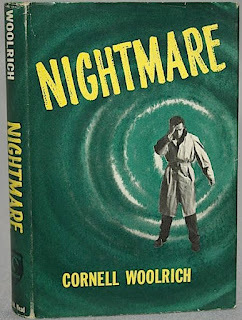 This was nine years before the idea of the cheaply priced mass market paperback book had been invented which didn't happen until after World War 2 when Simon & Schuster developed the idea with Pocket Books. 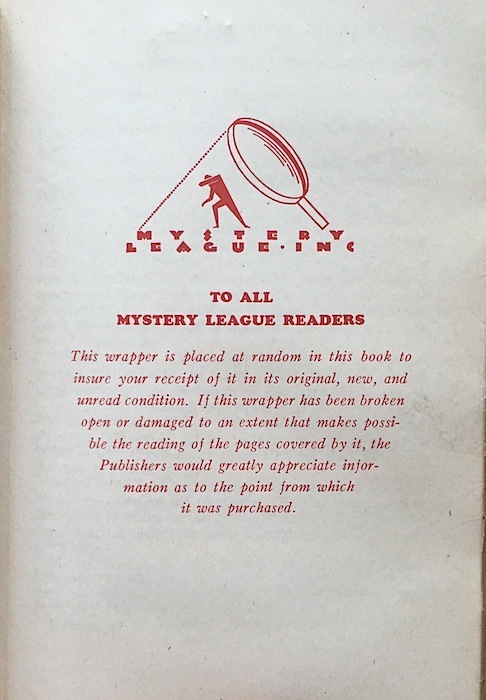 The odd thing about the Mystery League was choosing as their main distribution point the United Cigar Stores. Later, they added Whelan Drugstores and a few discount department stores like Kaufmann's to their list of places to sell their books. 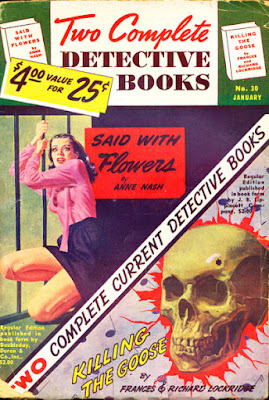 I guess when they realized that women were the main purchasers of these types of books ("According to Sydney M. Bidden, the young executive of the Mystery League which supplies a book a month to the detective-minded public, 60 per cent of the buyers of mystery novels are women" - New York Evening Post, 8/22/32) they decided to look for other places to sell the books. In the final years they found they needed to double the price to fifty cents per book. Apparently, that didn't save them and shortly after the price increase the entire imprint as originally envisioned ceased operation. 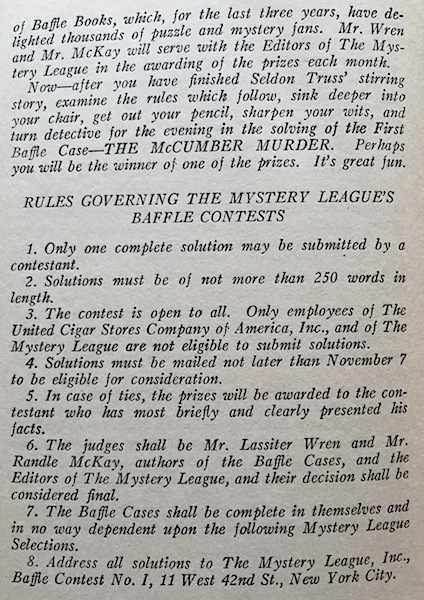 In an attempt to increase the sales they also added a mystery solving contest. With the help of the authors of the popular Baffle Books (solve them yourself mysteries published by Doubleday Doran's Crime Club) the publishers placed original mysteries in the back of three books (two shown below) asking readers to send in their solutions with the promise of cash prizes for first, second and third place entries. 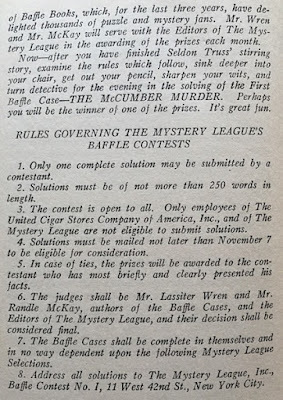 The answers along with winners' names were published in the next month's book. 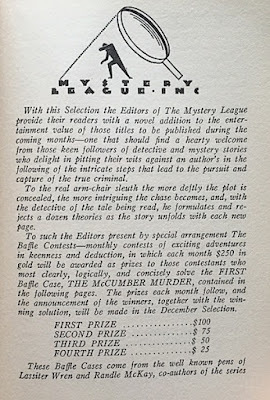 The answer and winner for the third and last contest never appeared due to the demise of the imprint. 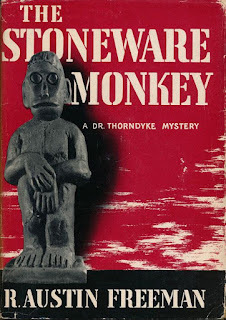 Interestingly, they also stole the idea of the Harper Sealed Mystery for at least one title, perhaps more. 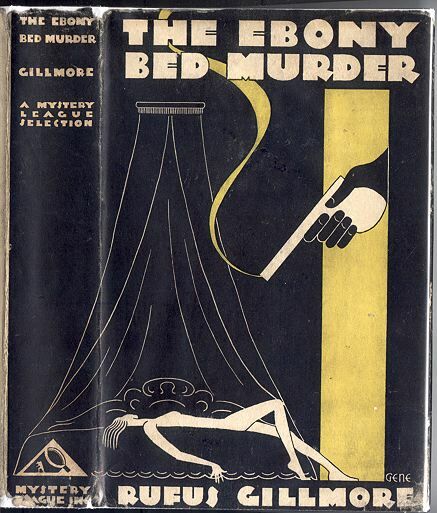 In my copy of The Ebony Bed Murder the seal is still intact (see photos below) though it has cracked and chipped over time. I've not read the book and will now probably have to find a reading copy if I ever want to since I have no intention of opening the seal all the way. Above you'll see the announcement for what was intended as "next month's mystery" after Death Points a Finger. 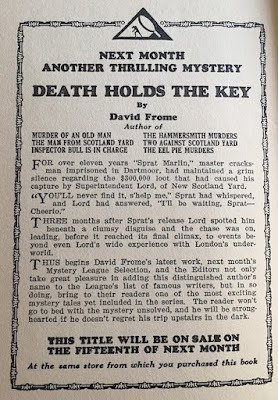 It was never published by The Mystery League, but it's not a phantom title for the "David Frome" portion of Zenith Brown's bibliography. 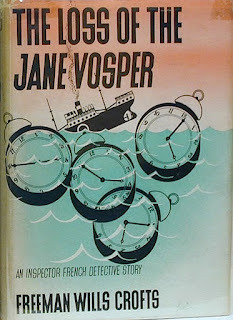 The book was published in the US as Scotland Yard Can Wait (Farrar, 1933) and in the UK as That's Your Man , Inspector! 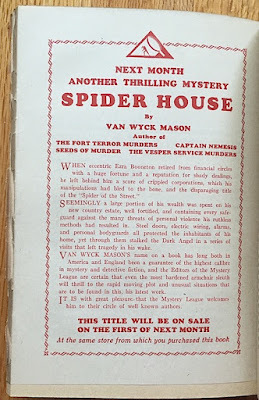 (Longman's, 1934). 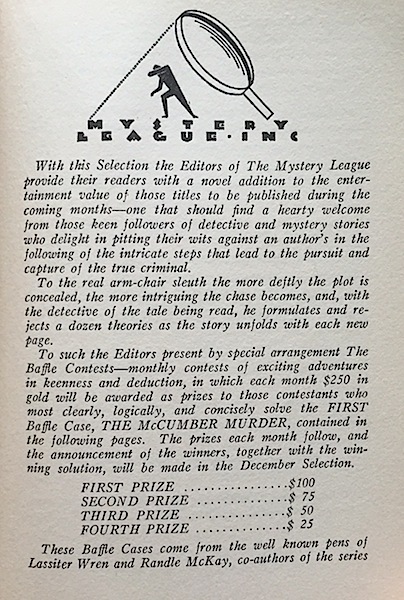 MORE ABOUT THE MYSTERY LEAGUE: I thought maybe this imprint had been written about already and I was correct. 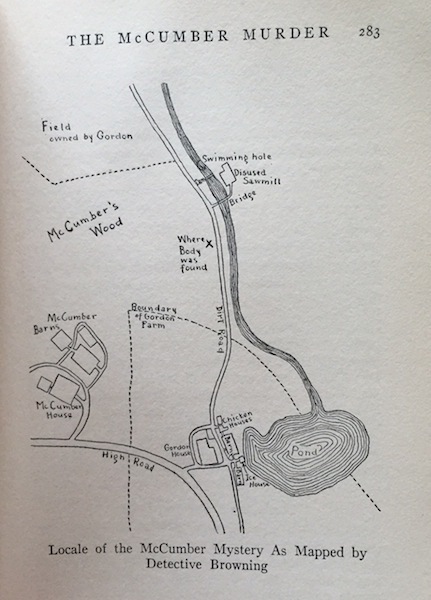 The possible identity of the artist "Gene" is discussed in great detail in a genealogical detective story of sorts at the blog Tenth Letter of the Alphabet. 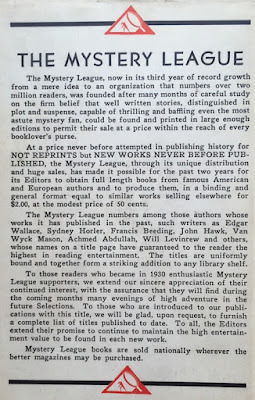 You'll also find a huge gallery of advertisements showing how the books were marketed over the years as well as the entire article "Women Love Gore" about the fan mail from women readers of The Mystery League books that I quoted above. Diane Plumley covers the books and writers of The Mystery League imprint in her usual cynically amusing way in an article at the Bookshop Blog. THE STORY: Doris Trent and Nell Witter are two middle-aged women who own The Flower Shop in Pinecrest, a northern California town not far from the San Francisco Bay area. It's a few days before Christmas and their only employee has slipped, fallen, broken both legs and is now recuperating in a hospital. How will they ever cope with the onslaught of last minute Christmas orders for people who say it with flowers? A fortuitous visit from a stranger who just happens to have a wealth of knowledge about plants and flowers and is charming to boot seems to be "a gift from God," as Nell puts it. His name? Barney Miller! But he's not a cop. They hire him on the spot. He works well with the customers and does a better job with choosing and carefully wrapping plants than poor Patrick in the hospital. Can he be too good to be true? Is it too coincidental that he appeared so conveniently? 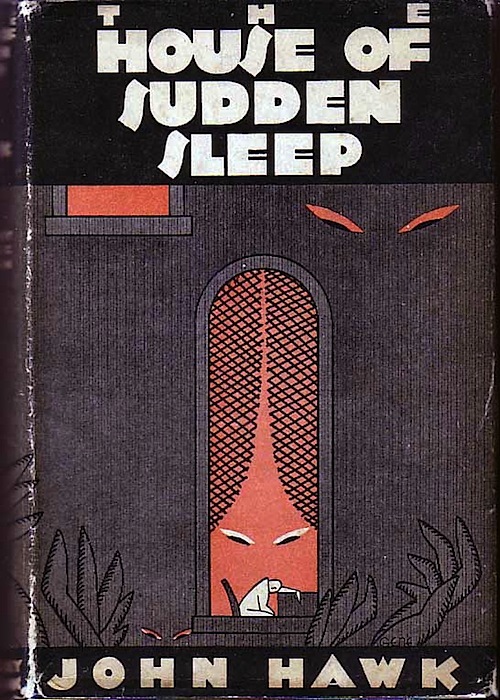 When a woman is found dead in the alley behind the shop and it appears to be yet another victim of a serial killer who has been murdering beautiful young women Doris and Nell suspect Barney may have chosen their shop as a hideout while he continues a murder spree. Of course the mystery of why Barney is at the shop proves to be more complicated than that. 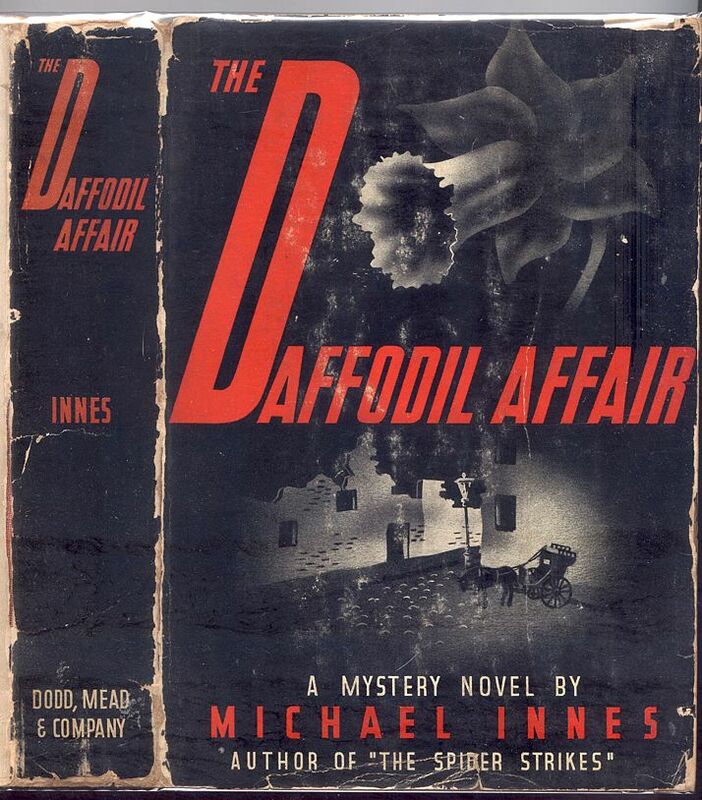 ATMOSPHERE: Said with Flowers (1943) was one of the many "specialty mysteries" that were cropping up in the late 1930s and throughout the 1940s. 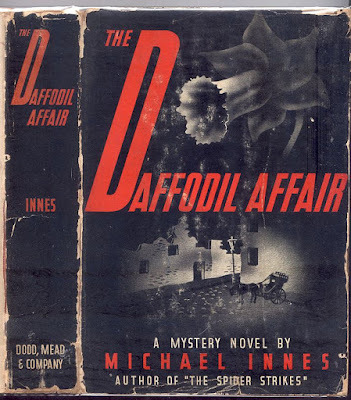 Perhaps already the savvy editors at Doubleday Doran's esteemed Crime Club imprint who published Nash's book had recognized that murder mysteries set in florists, libraries, department stores and other unusual locales with women amateur sleuths terrorized by stalking murderers were just the gimmick to sell more books to insatiable readers craving new spins on the detective novel. 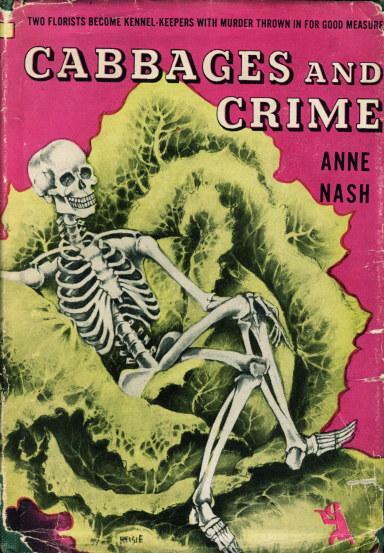 This was Anne Nash's first book. From the very first paragraph it is clear Nash is emulating the Mignon Eberhart school. 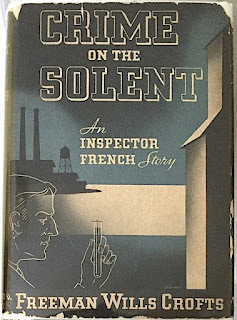 As narrated by Doris, who prefers to go by the nickname Dodo, the story is littered with lines like this: "And it was I--unknowingly, innocently, but it was I nevertheless--who helped the murderer commit the crime." 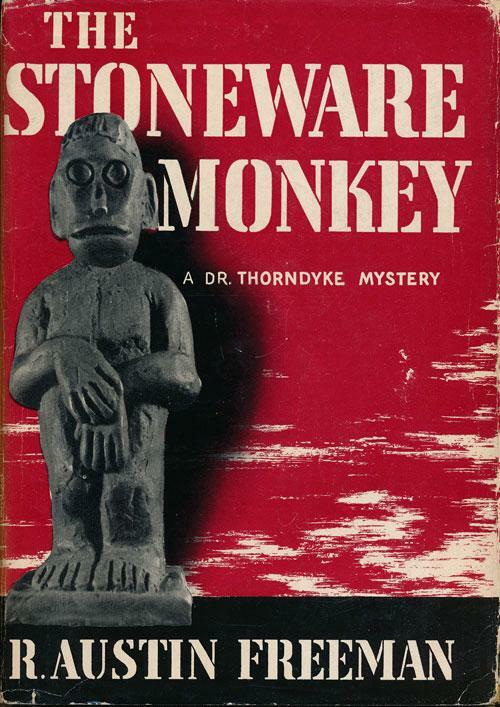 And throughout the novel Dodo wavers between trusting Barney as a good worker then disbelieving his presence is anything but sinister and a curse. 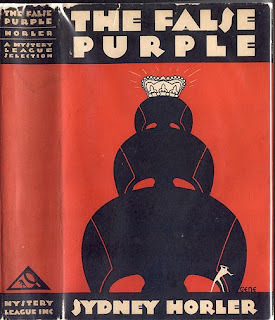 Barney is made to be the obvious villain of the piece, but anyone who has read these kinds of books just knows that all his mysterious behavior will prove not to be villainous but purposeful, albeit for ulterior motives that are not fully revealed until the closing chapters. There is a burgeoning forbidden romance as well and the reader is meant to be rooting for the lovers to survive all the violence and terror, come out alive and well and headed for the wedding aisle. The story is overly complicated by the subplot of the serial killer who inexplicably leaves drawings of fish on his victims. The search for this criminal, dubbed "The Karp Killer" by some cynical reporters, is almost completely unnecessary. There's never really any threat to anyone and the character exists only so that Barney can be suspected of being a charming psychopath on the lam. Despite an attempt to obfuscate and confuse the reader with weak red herrings it is clear that the murder of Rosalind Vance is merely a copycat killing because the crime doesn't fit the killer's M.O. Even though a fish drawing is pinned to her corpse she's too old, she was stabbed, and her body is found buried in a trash pile -- details that do not fit any of the circumstances of the previous nine victims' deaths. 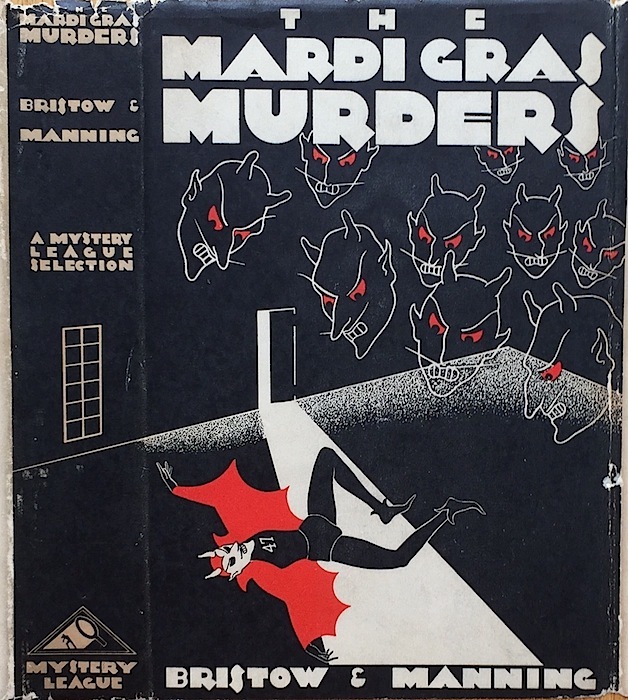 While all of this seems to be very modern for the 1940s remember that multiple murderer tales had been written by the scores throughout the 1930s, most of them by British writers, some even include the gimmick of copycat killing. THE CHARACTERS: Dodo is a typical narrator of the Rinehart/Eberhart school. She's not really interesting and her indecision about Barney's guilt or innocence gets to be a bit wearisome. On the other hand her tart tongued partner Nell is more than welcome when she's on the page. Brash, forthright, opinionated and one helluva wiseacre Nell provides the much needed enlivening to all the HIBK claptrap that makes up much of the story. 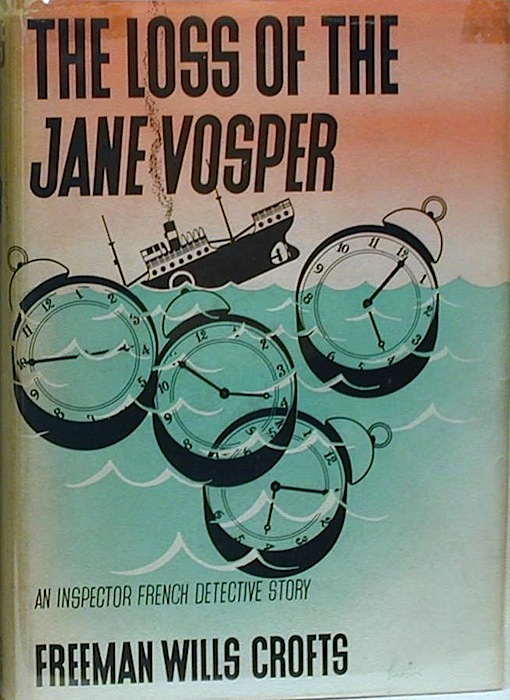 The suspects are types pulled from the Central Casting catalog of murder mystery characters. 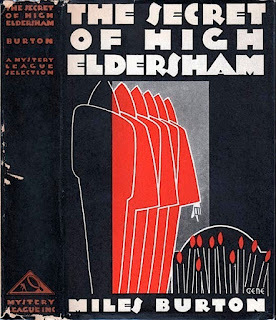 There is the embittered older sister, the devious husband, a ne'er do well creep who seems to be too interested in women half his age, an assortment of gossipy harridans haunting the florist shop with catty criticisms of wilted flowers and, of course, the young girl in peril who is the object of Barney's affection. INNOVATIONS: There aren't many to be found here. 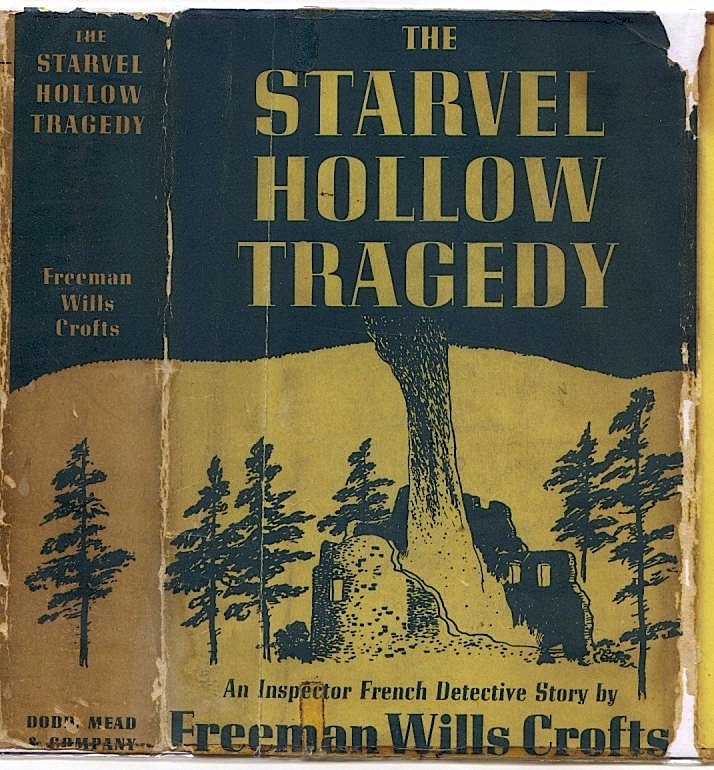 The story is overloaded with plot devices pulled from the Victorian sensation novel trunk. There are many secrets in the characters' past including the old motif of a child born out of wedlock that shamed the family. Continuing in this vein Dodo has an unnaturally prudish reaction to Barney's penchant for heavy duty swearing. There are four separate references to one incident of Barney swearing up a storm of curse words and foul language that make him seem like the Devil incarnate. She talks about his speech being indicative of pure evil. It's all a bit laughable to most modern readers accustomed to salty and vulgar language. I will mention an unusual use of a trained dog to literally sniff out clues. The minor policeman character Mark Tudor has a dog named Svea that helps find evidence. The dog comes in very handy at a climactic point late in the story. Another notable aspect is the rare way with which Nash deals with grieving. 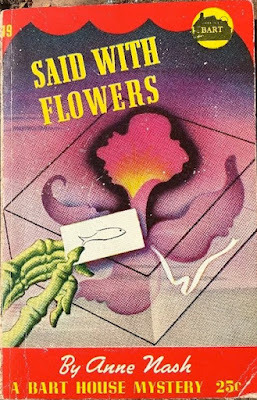 Probably because the novel combines the backdrop of a florist's business with the irony of a murder taking place at Christmas time Nash takes advantage of the way people express their emotions through the purchase of flowers. The title of the book becomes a multi-layered metaphor. 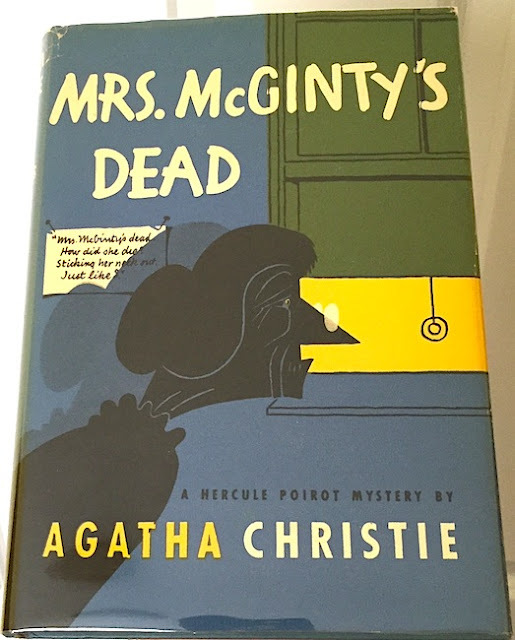 Grief is openly discussed in a way that made me notice how often that expression of emotion is so rarely brought up in detective novels of this era. When I came across this comment late in the novel I felt that my observation was even more justified: "What can we gain by learning anything more? 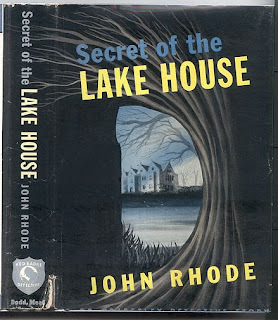 [...] What good will it do to find out who killed Rosalind? It won't lessen our grief any." 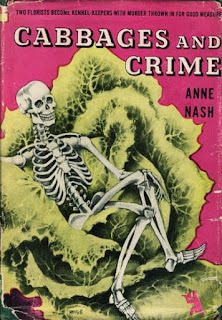 For her observations on the futility of crime solving in the face of inexplicable violence I give Nash several bonus points that more than make up for the shortcomings of her debut novel. THE AUTHOR: Anne Nash wrote three books all of which feature Dodo and Nell and a couple which have Mark Tudor. 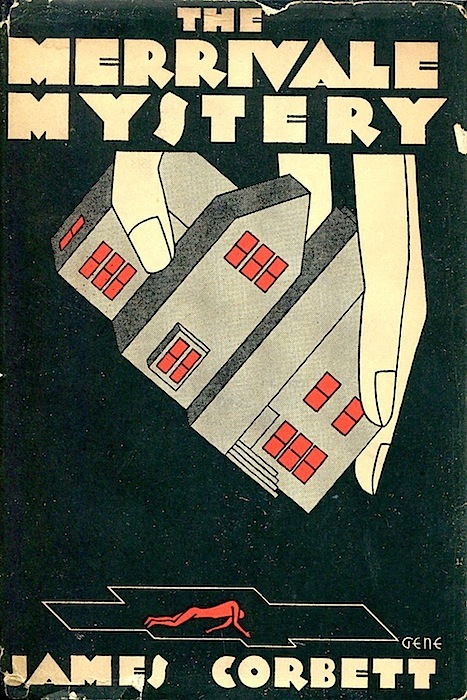 Her fourth and last mystery novel is a stand alone with no series characters and is set in a California boarding house. The way Nash talks about Svea in Said with Flowers is indicative of a genuine love for dogs. She may have been involved in dog breeding or the care of dogs based on the descriptions of Svea and the dog's behavior in a way that only a true dog lover would write about the animals. In fact, her love of dogs plays a major role in her third novel, Cabbages and Crime, in which the two women travel to Death Valley to help run Dodo's cousin's dog boarding kennel and a murder once again involves them. EASY TO FIND? Act now before midnight, as they say on TV infomercials. 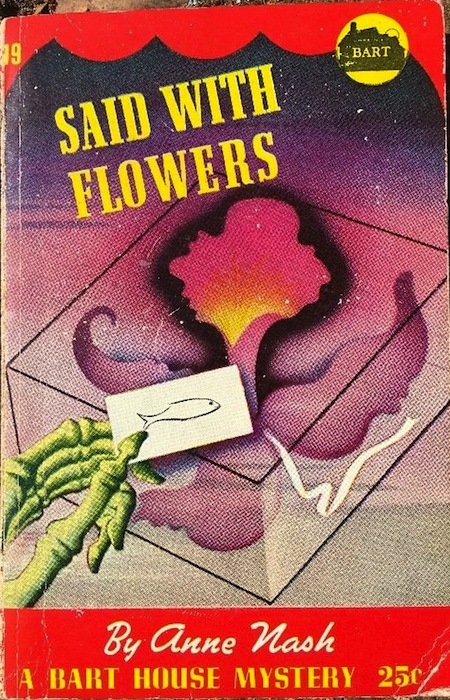 Said with Flowers was published in hardcover by the Crime Club in the US and Hammond in the UK. There is also a US paperback reprint by Bart House. 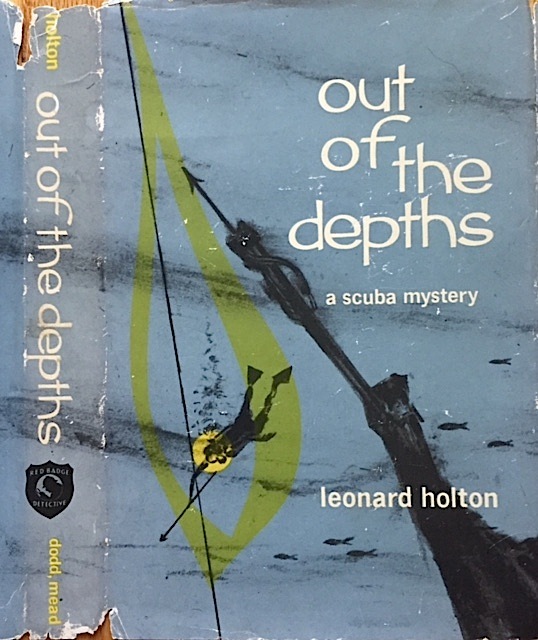 All three editions pop up for sale every now and then with the paperback the easiest to find. Currently there are a handful of the Bart paperback copies being offered for sale online. As for the other mysteries by Nash your chances are much bleaker. I found very few copies of the third and fourth titles for sale and absolutely none of the second title Death by Design. For years I kept coming across the Norman Conquest books being offered up for sale on various bookselling websites. “Hmm,” I often mumbled to myself. “I wonder if those are any good.” But I never gave in to temptation. 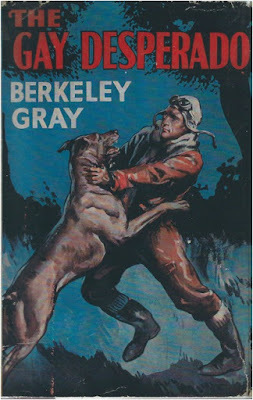 Maybe in the back of my mind knowing that “Berkeley Gray” was one of the many pseudonyms of the prolific thriller and crime fiction writer Edwy Searles Brooks kept me away for decades. 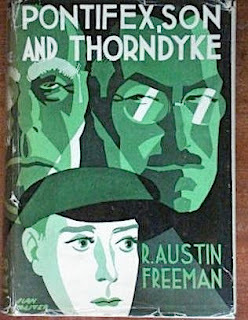 The bulk of Brooks’ career was spent writing juvenile adventure stories for the British boys’ magazines and then spending a lot of time writing for Amalgamated Press and helping to further the exploits of Sexton Blake. 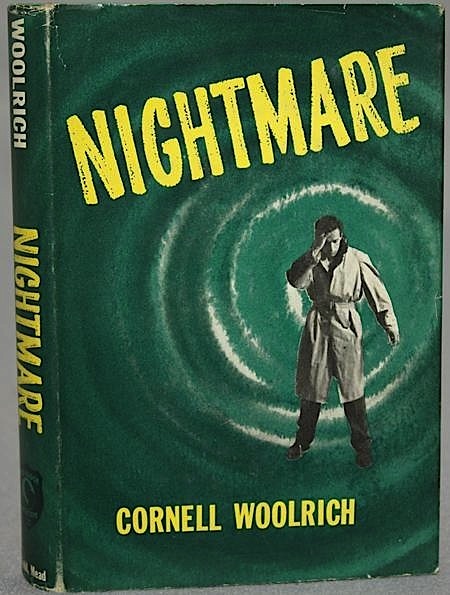 I’ve never been interested in that kind of thriller so I avoided all of his books under his various guises. Then one day earlier this year I stumbled across a mini library of Norman Conquest books at a Half Price Books location near me. All of them were $8 or less and so I bought them all. When I learned that Norman Conquest is a sort of clone of Simon Templar and that one of the books I now owned was published in 1957 fitting into this month’s Crime of the Century reading challenge, I decided to finally sample one of the adventures of the man known as the “Gay Desperado”. My fears all proved well founded. Even though this book was written in the 1950s it was like travelling back to the early twentieth century and read very much like a boy’s adventure story. There is nothing remotely modern about Conquest after Midnight (1957) which is a very old-fashioned potboiler. There is a rich master criminal (a prominent member of Parliament who owns an independent political newspaper) who devises a preposterous plot in order to remove a former business partner he cheated and who is now planning to expose him. Does he threaten him with violence or shoot him dead? Does he hire a thug to beat the guy up or otherwise scare him into silence? No, the M.P. pretends to be interested in starting a private zoo, buys a lion, and hires a couple of men to let the lion loose on his enemy who he knows takes an evening stroll. 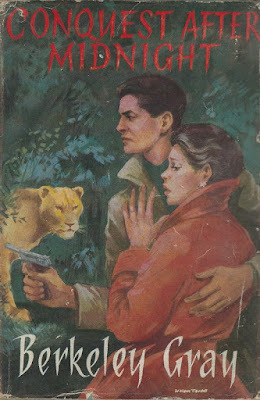 Let the lion be blamed for having escaped and mauling the man in a surprise but bizarre encounter at night. And everyone chalks it up to an accident. You have to give Rupert Hargrove credit for over-the-top imagination. Other bad guys might just try to run down the guy with a car. I think Hargrove watched too many old movies. 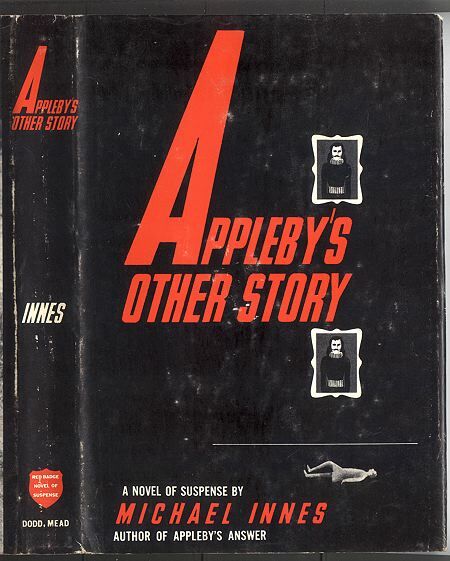 Though filled with cinematic escapades and melodramatic incidents the story is very thin. 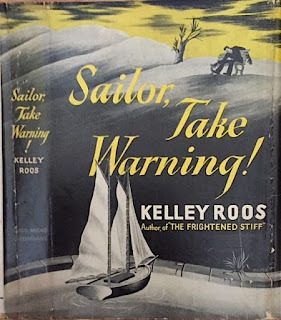 It easily could be told in less than 100 pages but Brooks’ long career in writing serials for magazines reveals the curse of this kind of penny-a-word writing: constant and needless reiteration. If the story was read from week to week the recounting of previous events would be somewhat necessary. To have Conquest tell characters things we’ve already been told three pages prior is more than annoying. A simple sentence like “He told Fiona what he told the police.” would serve perfectly fine. Not for Brooks. He must tell us two, three, sometimes as many as four times things that need only be explained once. I’ll admit that it was fun to see how many quirks Norman Conquest has in common with Simon Templar and similar “gentleman adventurers” found in thriller fiction. He is independently wealthy having amassed a fortune from somewhat crooked dealings, helping himself to portions of the wealth of the rich villains he does battle with. Like Templar he leaves behind a calling card. Conquest’s has the significant date 1066 printed in red. Cute. A coil of rope Conquest “invariably” wore “as an additional article of attire.” Added as an afterthought: “Easily carried between his undershirt and shirt and quite comfortable.” Batman’s utility belt would be a lot more comfortable. Wry commentary meant to be witty but falling short of the mark: “This was no occasion for applying the Queensberry rules” when Conquest starts throwing punches in a fistfight. An Italian villain actually exclaims “Maledizione!” when foiled as if he were Snidely Whiplash in a literally translated Dudley Do-Right cartoon. Conquest boards his private airplane (a Mills Conister Fury) with his wife and pilots his way to Italy to rescue the requisite damsel in distress who of course is being used as a bargaining chip. Hand over the incriminating documents or the girl gets it--- all the way over in Italy, no less. 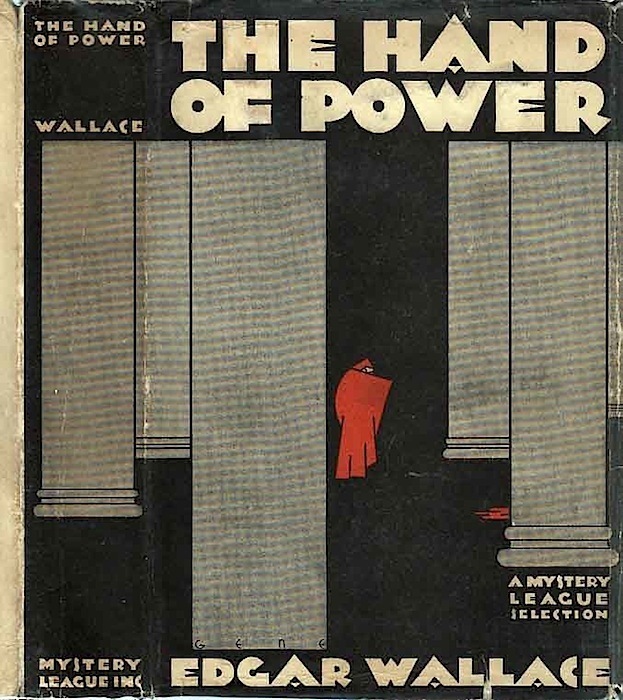 This is the type of book where the rich and powerful villain can’t be bothered to save his own skin. 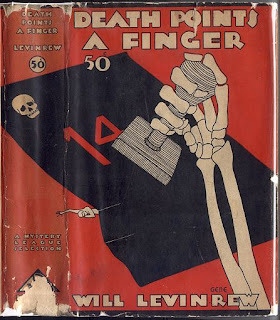 He hides behind his façade of respectability and hires goons and lummoxes, and in one case a femme fatale who owes him a favor, to do all his ludicrous dirty work. There would be no story if these crooks behaved like real violent criminals who want to protect themselves and just shot everyone dead. 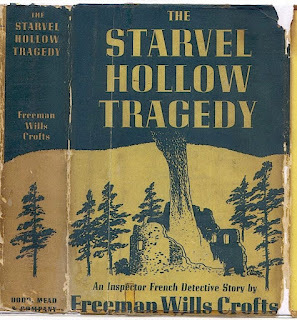 Instead we get all this globetrotting silliness, murder by a “monstrous device” that resembles lion claws, kidnapping on board a cable car in the Italian mountains, and stowing the abducted damsel in a refugio hidden in the forest. 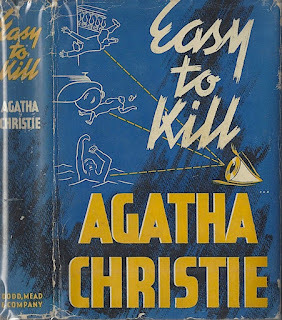 I expect more from a writer with a long career in concocting this kind of formulaic crime novel. 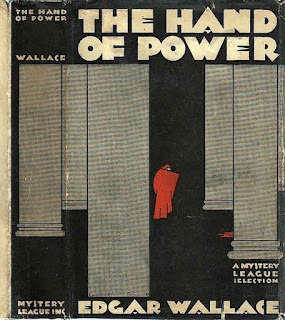 Most crime writers who have successfully had long careers spanning multiple decades found it necessary to evolve and adapt to reflect how the plots, characters and formulae of crime fiction change with the times. Brooks seemed to find it very easy to cling to his origins and remain firmly rooted in the past. After reviewing the various bibliographies at the Edwy Searles Brooks tribute website I learned that Brooks recycled many of his stories. This tends to be the curse of the writer who feels compelled to produce numerous books at a logic defying rate. John Creasey did the same thing in order to deliver his hundreds of books in his various writing personas. 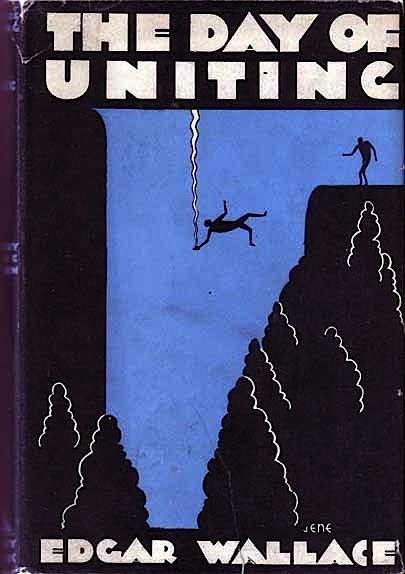 Though many of the Norman Conquest books are noted as being rewrites of plots Brooks used in boys' papers or other pulp magazines Conquest after Midnight apparently was an original story for this series. Could have fooled me. 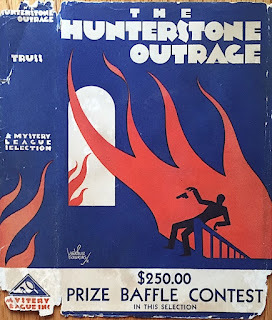 This is my second contribution for the Crime of the Century vintage mystery blog meme sponsored by Past Offences. 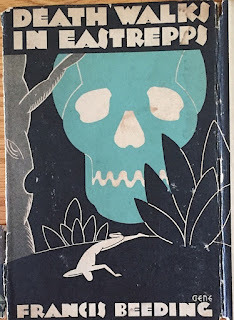 During May we read books published in 1957. My other, much more enjoyable read, was Three for the Chair by Rex Stout. 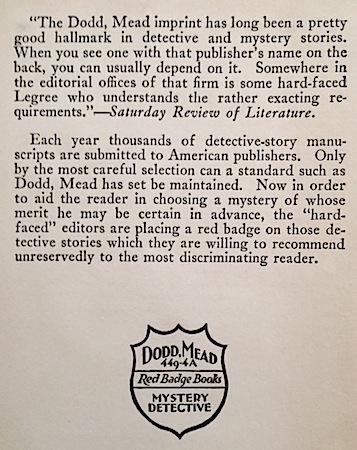 One of the longest running mystery novel imprints was Red Badge Detective put out by Dodd Mead. The earliest date I can nail this down to is 1930. 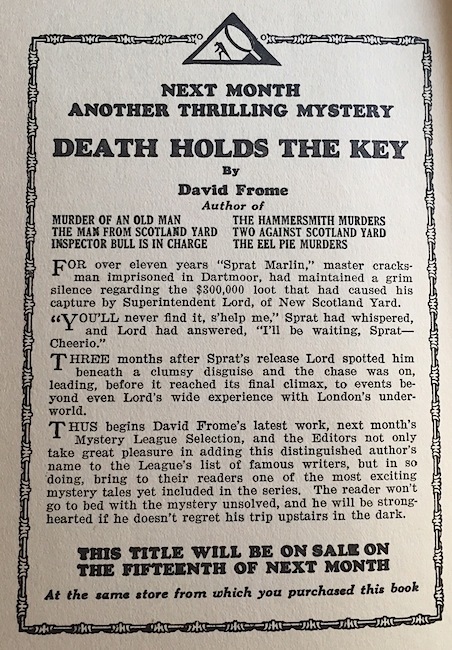 According to an advertisement included in the first few titles, this imprint was invented to distinguish the best of Dodd Mead's mystery novels. 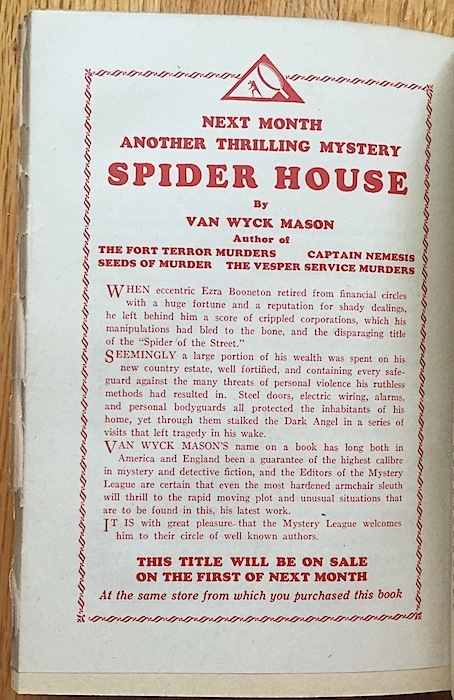 But as far as I can tell every single mystery novel published by Dodd Mead throughout the 1930s and 1940s carried this imprint info. 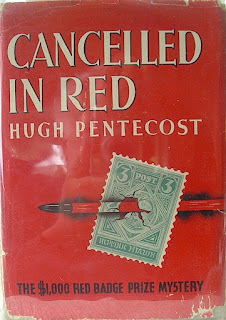 It was only towards the end of the imprint in the late 1960s and through the mid 1970s that only a few books carried the Red Badge logo. 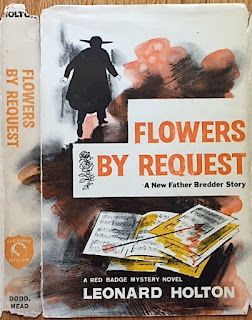 For instance, Agatha Christie's books were not Red Badge throughout the 60s or 70s while someone relatively new like Leonard Holton was given the Red Badge logo. I guess as Dodd Mead decided it was no longer necessary to brand a recognizable mystery writer like Christie and saved the Red Badge logo for less well known writers they were interested in highlighting. The Red Badge imprint also sponsored a mystery novel writing contest that lasted only four or five years. 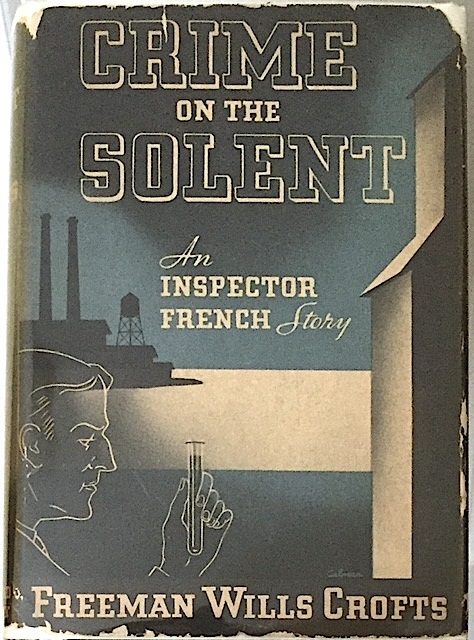 The first winner in March 1937 was Clifford Knight for his detective novel The Affair of the Scarlet Crab which introduced his sleuth Huntoon Rogers. He won $2000 in addition to having his work published. 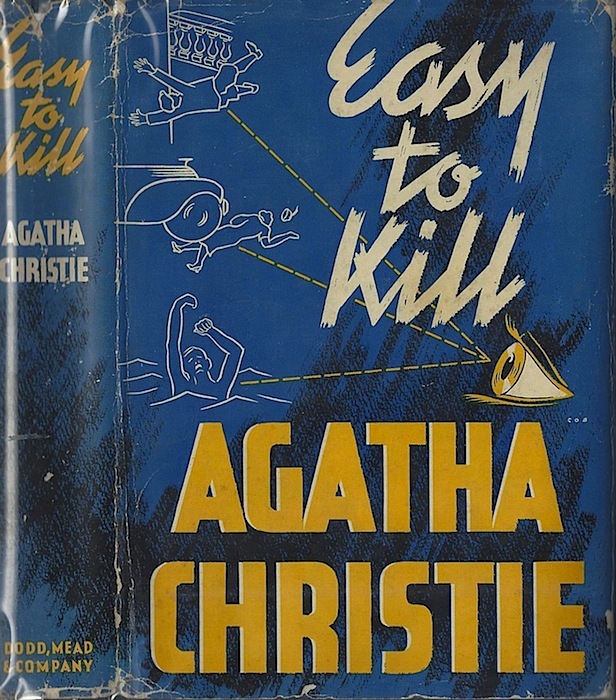 Knight went on to write 23 more detective and suspense novels. 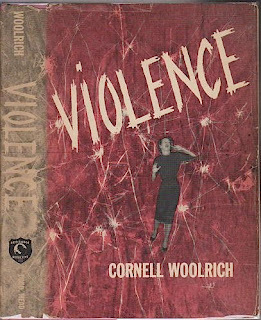 Other winners such as Ruth Sawtell Wallis whose first novel Too Many Bones won the prize (only $1000 for her) in 1943 were not as prolific. And some wrote only one novel, collected the prize, saw the book published and were never heard from again. 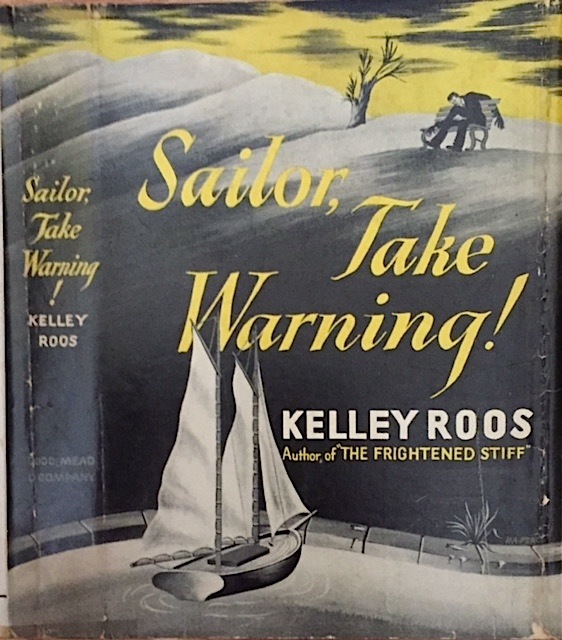 Check out the photo of the rear flap of Sailor, Take Warning! 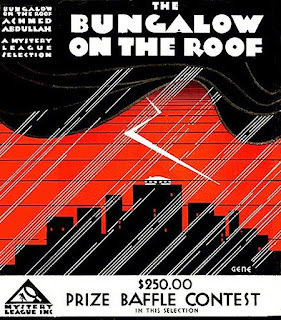 (shown below) for the lowdown on the contest. Once again this post shows a mixture of DJs from my own collection and some that I managed to find from online booksellers' catalogs. 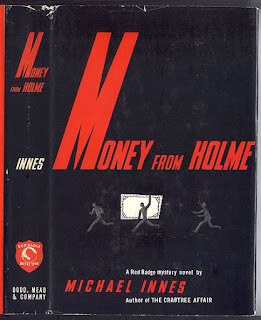 The authors who were published by Dodd Mead during the heyday of the Red Badge imprint were among the elite of mystery and crime fiction. 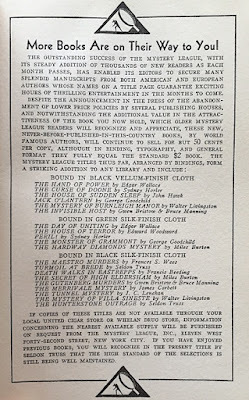 They included Agatha Christie, R. Austin Freeman, Freeman Wills Crofts, John Rhode, Kelley Roos, Michael Innes, Clifford Knight, Lee Thayer, Hugh Pentecost/Judson Phillips, Bart Spicer, William McGivern, Ursula Curtiss, Rae Foley, two books by Cornell Woolrich, and two books by Edmund Crispin after he was dropped by Lippincott. 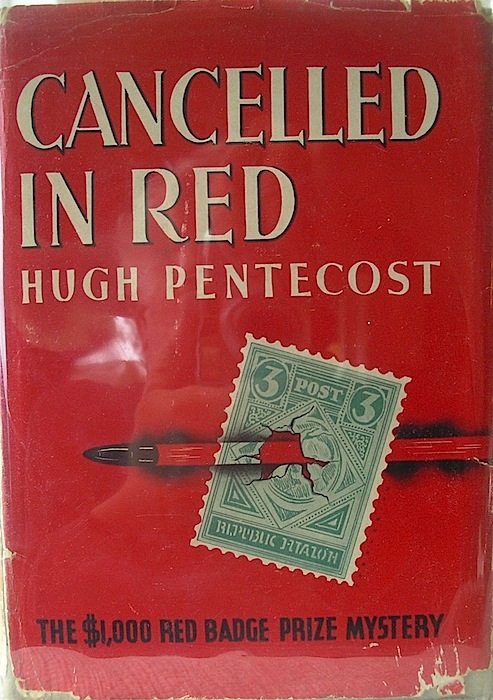 Note that by 1974 while the Red Badge name was still being used, the logo with the detective had been abandoned on the spine of the DJ. 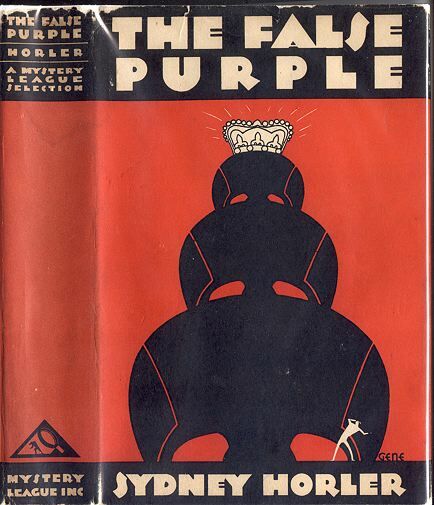 The imprint, the brand name and the use of the logo would disappear from all mystery and suspense fiction by the end of the 1970s. "All of us had a delightful time and hope that cleaning up the wreckage wasn't too much for you." 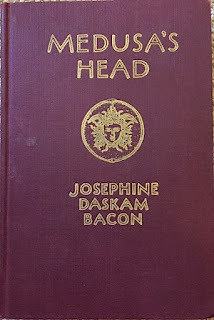 It's rare that I come across anything for this one time regular feature where I write about things I've found in books. But when I do I'm excited to share it with the world. 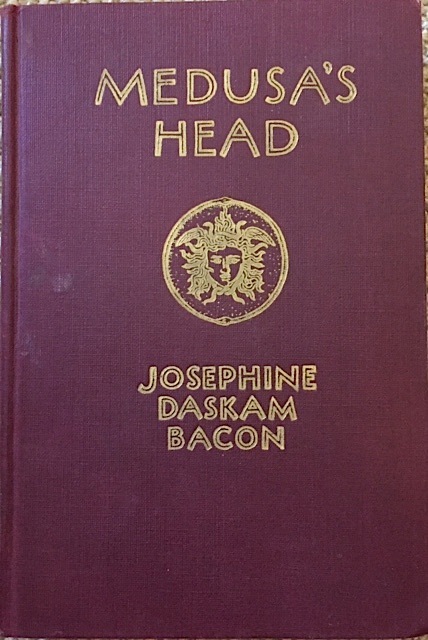 This letter was discovered in the pages of a copy of Medusa's Head by Josephine Daskam Bacon. I'll be writing about Bacon's supernatural stories later this year, probably in the fall. 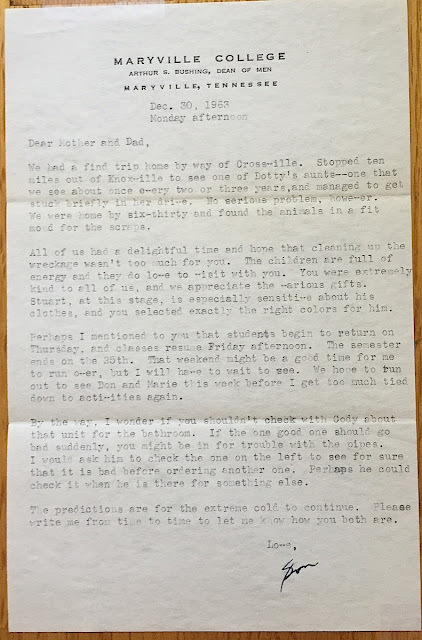 The letter was written by Arthur Bushing, a Midwestern American academic, to his parents who lived somewhere near Knoxville, Tennessee. 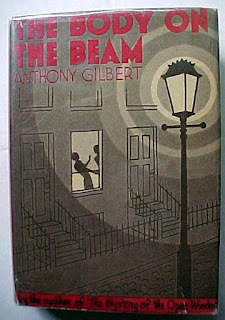 It's an interesting slice of life from 1960 written by a seriously minded man who cares for his parents and family. His concern for a plumbing problem in their bathroom made me smile. 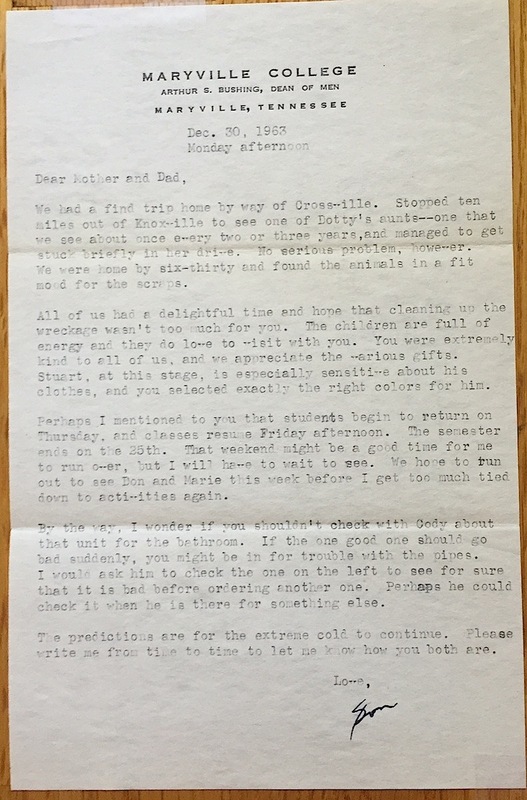 Click to enlarge in order to read the full letter. I just tested it and it enlarges to a huge, very legible photo. I like that he signed the letter Son. So old fashioned. Reminds me of my mother and uncle who were never called by their real names in their home by their parents. My grandmother always called them Sis and Sonny. Odd, but folksy and revealing of their backgrounds. I learned a lot about Bushing from his obituary published on the website for Maryville College. 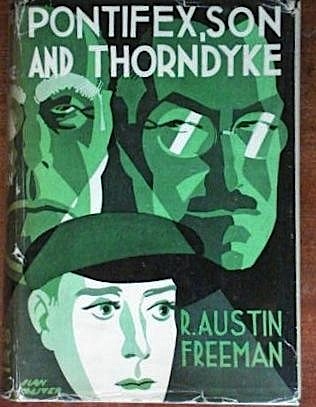 His father was also named Arthur S. Bushing and this book was owned by his father who stamped his name on the endpapers and wrote his name in pencil on the flyleaf. Both Bushing Senior and Bushing Junior were English professors. Bushing the son attended Maryville College, graduated in 1943, was hired as a physics instructor (his minor in his degree), then changed to teaching English which was his major field of study. He also served in World War 2 earning some military medals for his active duty in two European battles. He worked his way up the ivy-covered ladder from professor to department chair to Dean of Men and retired in 1996 after fifty-three years at the same institution. Remarkable. This kind of dedication in a career and loyalty to one employer is rare these days.